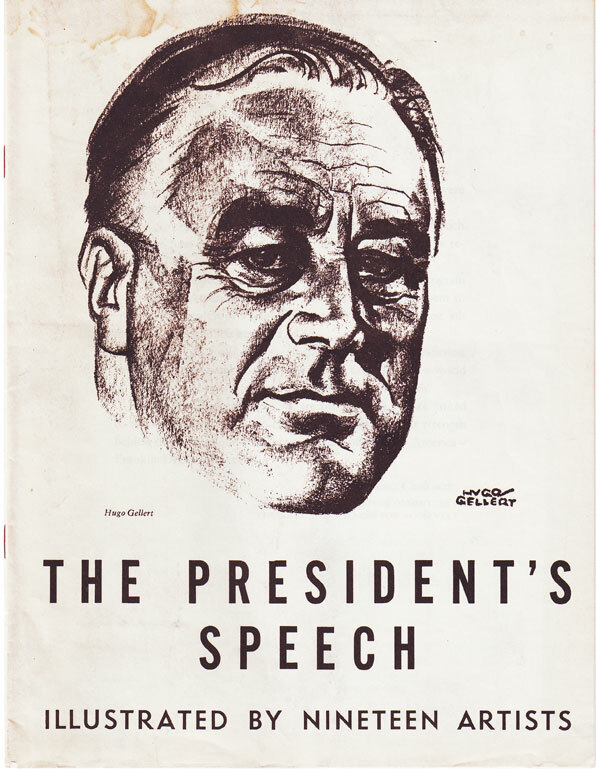 To support President Franklin Delano Roosevelt’s 1944 re-election campaign, Syd Hoff, Crockett Johnson, Lynd Ward, Hugo Gellert, William Gropper, and fourteen other artists illustrated this booklet. The text is FDR’s speech made before the Teamsters Union on September 23rd, 1944 — also known as the “Fala speech,” since it features his dog, Fala. Here is Syd Hoff’s page. 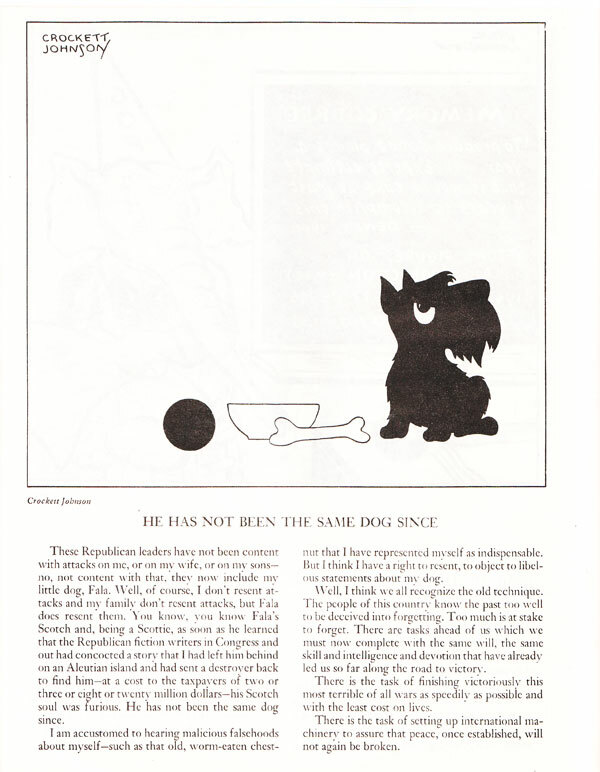 Here is Crockett Johnson’s page. You’ll note that he drew the famous Fala himself. All artists were members of the Independent Voters Committee of the Arts and Sciences for Roosevelt, a Popular Front alliance devoted to progressive causes. Indeed, following the election, the group became the Independent Committee of the Arts, Sciences, and Professions (ICASP), which in December 1946 merged with the National Citizens Political Action Committee — becoming the Progressive Citizens of America (PCA). 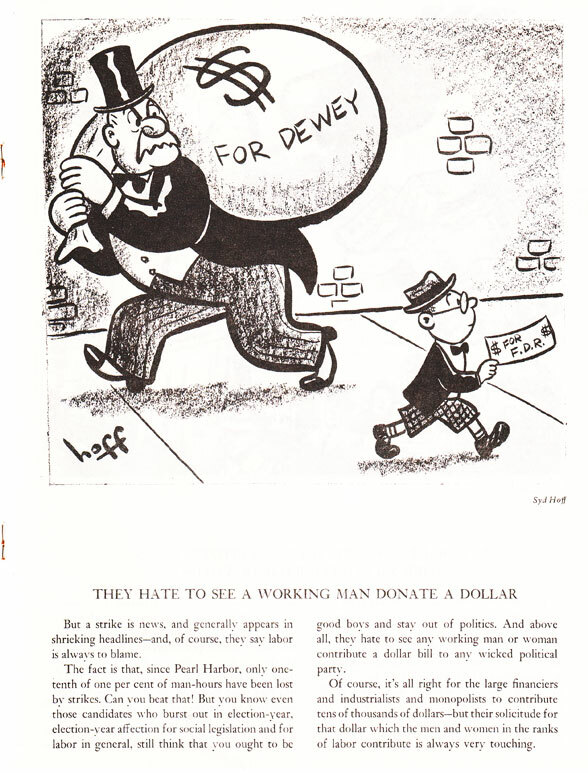 The PCA became the Progressive Party, which ran Henry Wallace for President in 1948. A long-time member of the Roosevelt administration, Wallace was FDR’s Vice President during his third term (1941-1945). He also served as Secretary of Agriculture (1933-1940), and Secretary of Commerce (1945-1946). In that 1948 election, he came in fourth, just behind Dixiecrat Strom Thurmond. Dewey, who came in second in 1944, again came in second this year. The winner was Truman, who had been President since FDR’s death in 1945. A much earlier version of The Purple Crayon and a Hole to Dig: The Lives of Crockett Johnson and Ruth Krauss (forthcoming from UP Mississippi in 2012) included appendices, listing members of progressive organizations to which Johnson belonged. I find constellations like that to be fascinating. Due to space, these appendices have been cut. But I plan to post them at some point. Really like your article.FDR was a great president and was very attuned to the needs and wants of the people .Sadly to say ,that is not the case with the one we have now. I have this speech with it’s illustrations, inherited from my mother-in-law, but I just read it today for the first time. It is just as relevant in 2019 as it was in 1944. If FDR were President today, prejudiced people might shallowly stereotype him as “an East Coast elite”. The truth is that he cared profoundly about laboring people and provided jobs for those out of work. We need another New Deal and if he was alive today I believe he’d vote for The Green New Deal.